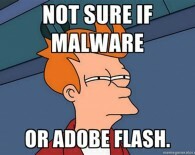 Home » Meme » Adobe Flash Malware? All too often the line is blurred with Adobe flash and malware. I find this meme to hit it right on the head. One of the most used trouble makers in the web world. Do yourself a favor and avoid Adobe Flash; it got its end of life status anyways.